After years of rapprochement, the relationship between Russia and the West is more strained now than it has been in the past 25 years. Putin’s motives, his reasons for seeking confrontation with the West, remain for many a mystery. Not for Mikhail Gorbachev. In this new work, Russia’s elder statesman draws on his wealth of knowledge and experience to reveal the development of Putin’s regime and the intentions behind it. He argues that Putin has significantly diminished the achievements of perestroika and is part of an over-centralized system that presents a precarious future for Russia. Faced with this, Gorbachev advocates a radical reform of politics and a new fostering of pluralism and social democracy. Gorbachev’s insightful analysis moves beyond internal politics to address wider problems in the region, including the Ukraine conflict, as well as the global challenges of poverty and climate change. Above all else, he insists that solutions are to be found by returning to the atmosphere of dialogue and cooperation which was so instrumental in ending the Cold War. 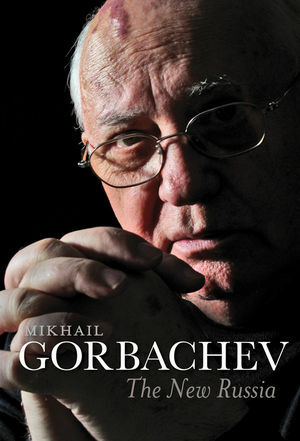 This book represents the summation of Gorbachev’s thinking on the course that Russia has taken since 1991 and stands as a testament to one of the greatest and most influential statesmen of the twentieth century. The zero years of the 2000s? A second presidential term: what for? A new direction, or more of the same? A new Era of Stagnation? "This is a reminder of how vast was [Gorbachev's] achievement in allowing in the light of freedom. Where his contemporary, Nelson Mandela, was great beyond the whites' deserts in building a post-apartheid nation, Mr Gorbachev was great beyond the deserts of the Soviet Union (and perhaps even of the west, which could barely understand or trust him) in proposing a way for the despotic world to aspire to democratic governance, freely organised civil society and rule of law. That he failed, he keenly knows. Our best hope is that his ideas, in time, succeed." "There are not many good books on new Russia. Mikhail Gorbachev’s The New Russia is probably the best book in many years. It is packed with knowledge, analysis, and new perspective on Russia." "Compelling…An important book for understanding the shape of the world today." "He has produced a reflection full of an earnest desire that former enemies understand each other and find common ground in a febrile world. This is a reminder of how vast his achievement was in allowing in the light of freedom." "Even-handed and measured, the memoir places Gorbachev's concern for the Russian population, the rule of law, and the principles of democracy at the centre, offering a cautionary tale that speaks directly to contemporary issues."